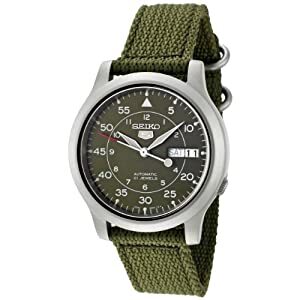 He'll be ready for that next outdoor adventure with this watch. The brushed stainless steel case looks great next to the green face and green strap, giving this watch a military feel. It's a great everyday watch. Actually, it's best to wear it every day. The watch uses arm movements to wind itself (never needs batteries), and if not worn for about 36 hours then it will stop. Avoid that problem by wearing it every day. This watch has many devoted fans. It's a solid watch that should last for years.